Why use a stick on plastic cover when you can have the real deal? Our chromed oem final drives finish off that look you’re after for the tail of your Suzuki M109r. All final drives receive new seals and bearings when they are reassembled after chrome. When we receive a final drive in we dont know if it has 20 miles or 20k miles on it so we rebuild them all. We have yet to have any issue with these. All work is guaranteed. Most have us do their builds as we have done many. If however you plan on doing housing only you must remove all components from the housing. There are bearings that require special tools to remove. If you require this service we can do this for you. These are sold on an exchange basis. We require that you send us your undamaged final drive. If you want us to send you one up front we can do this but a security deposit is required. 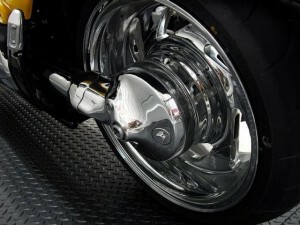 We offer chrome oem parts exchange for all M109r parts. We have blinged many. We are your one stop bling shop. If you don’t see it just ask. Please contact us with any questions and review our policy page before placing orders. We happily work one on one with our customers to help you have it your way. These parts are done custom and delivery times can vary from case to case.